Caring staff at Forest Manor Nursing Home have opened an old-fashioned bar to help evoke memories for residents with dementia. Forest Manor Nursing Home on Mansfield Road cares for 40 residents, many of which have dementia. In a bid to take residents on a trip down memory lane, staff at the care home have built a fully working nostalgic pub -complete with optics, hand pumped ales and a jukebox. Janice McNeil, registered manager of the home said: “Our residents are at the heart of everything we do, and building this bar has been a real team effort. “We have a wonderful team of staff, and families of loved ones who enjoy being part of new ventures. “We have had optics and furniture donated from different pubs in Ashfield, with a special thank you to The Picture House, and the families of residents have brought us bottles of beer. Resident Sue Eldridge helped to cut the ribbon, and declared Forget-me-Not officially open. 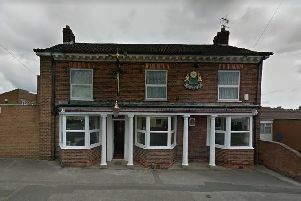 Residents from the care home are encouraged to use the pub as a way of recapturing the feeling of ‘going for a pint’ as a social activity with other care home residents. For those with dementia, a connection to past activities can help with the way they manage their condition in the present. A person with dementia is also more able to recall things from many years ago than recent memories, so reminiscence often gives them a huge sense of comfort. The pub, which is named ‘Forget-Me-Not’, was officially opened with a special party on February 1. The 67-year-old said: “The bar is lovely. “I’ve seen it grow over the last two weeks, and the team has put a lot of work and effort in. As authentic at the bar looks, Janice and her team have some tricks up their sleeve when it comes to alcohol. “The Jack Daniels bottle is filled with cooled tea!” She said. As well as drinks behind the bar, the team has sourced pre-decimalisation money, to give residents an authentic experience. Regular quiz and games nights will also keep residents entertained. Janice had the idea to recreate an old pub when she researched what improvements could be made to enhance the lives of residents at Forest Manor. After discussing her ideas with owner Heeren Mahadoo, who thought a bar was an excellent idea, Janice and Michelle Spours, team leader quickly set about gathering furniture and items for the bar with the team. Kath Fox, whose husband is a resident said: “I can’t fault Forest Manor, the bar is fantastic. “It’s done to a really high standard, and they’ve thought of everything. Janice added that Forget-Me-Not will allow residents to live as close as possible to ‘normal’ life outside of a home. “We promote dignity for our clients, and we want them to live life as if they do not have dementia as closely as they can. As well as the bar, staff at Forest Manor do all they can to keep residents happy and entertained, including day trips to Matlock, Skegness, and even Twycross zoo.